Offering a stunning vintage 1940s Western Electric 302 red desktop telephone. This is a model 302 Deco style desktop telephone from Western Electric, which started production in 1937. It was their first model with the ringer encased inside the telephone. Prior to the 302 model, all of their telephones had a separate wall mounted ringer box. The telephone has been meticulously refurbished, with gorgeous glossy red enamel. The ringer sounds fantastic. The original model F1 heavy bakelite receiver has excellent functionality and calls are crisp. All the cords are in new old stock condition, with a modern style modular line cord plug. The telephone is ready to plugin and use. This is an exceptionally well refurbished phone. Western Electric designed their phones for uncompromising reliability and durability. This is a very fine example of a model 302 telephone from the era. Ready for use right out of the box. Click here for more details. 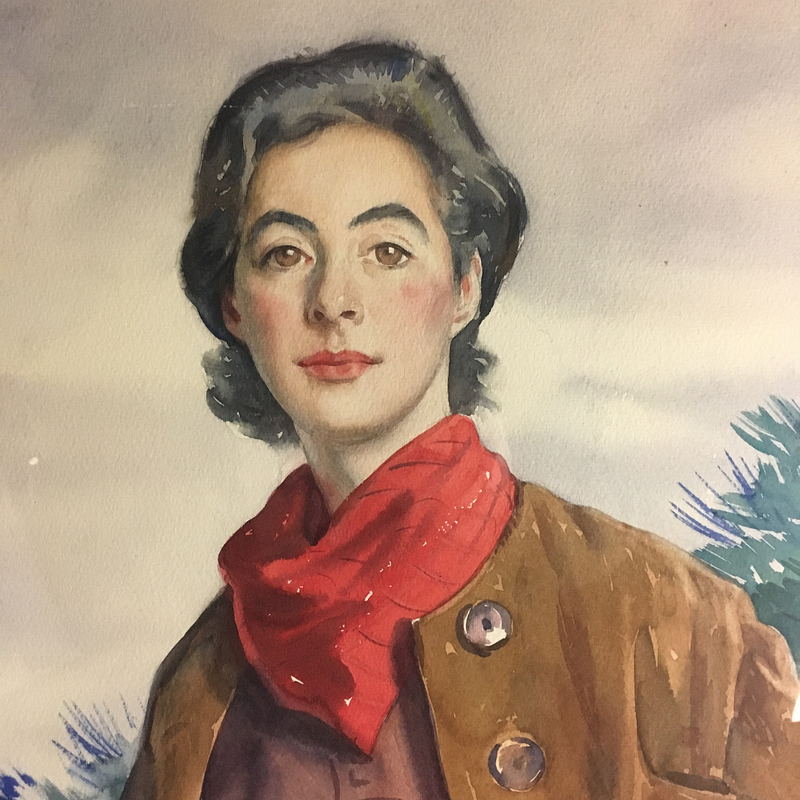 Large portrait painting by Aiden Lassell Ripley (American, 1896-1969) of Lexington, Massachusetts. Untitled. Watercolour signed and dated 1935. The portrait painting displays an attractive young lady in outdoor or riding attire. It has not been examined outside the frame, but it’s possible there’s a name or title on the rear. This painting was acquired in Western Massachusetts, so it’s likely the background scenery is of the Berkshires. Painted in late autumn or winter of 1935. The colours are vibrant for a watercolour of this age, with no age related issues. Fantastic details and composition. No damage to the watercolour. The mat has some spotting and a small light stain on the bottom right side corner. The portrait is framed in a large intricate gilded frame. Some minor water damage to the plaster of the gilded frame along the bottom portion, with a few small pieces of missing plaster. The portrait painting can hang as it is, or the watercolour can be re-matted and the gilded frame repaired. Aiden Lassell Ripley was an American artist and conservationist, known for his outdoor scenery and commissioned paintings. He worked in both watercolour and oil paint. Many of his works reside in the Boston Museum of Fine Arts, the Metropolitan Museum and other prominent American museums. Note: Several shipping options are available. Please be in contact for shipping details, cost and delivery timeframe. “White glove” delivery available throughout the US. 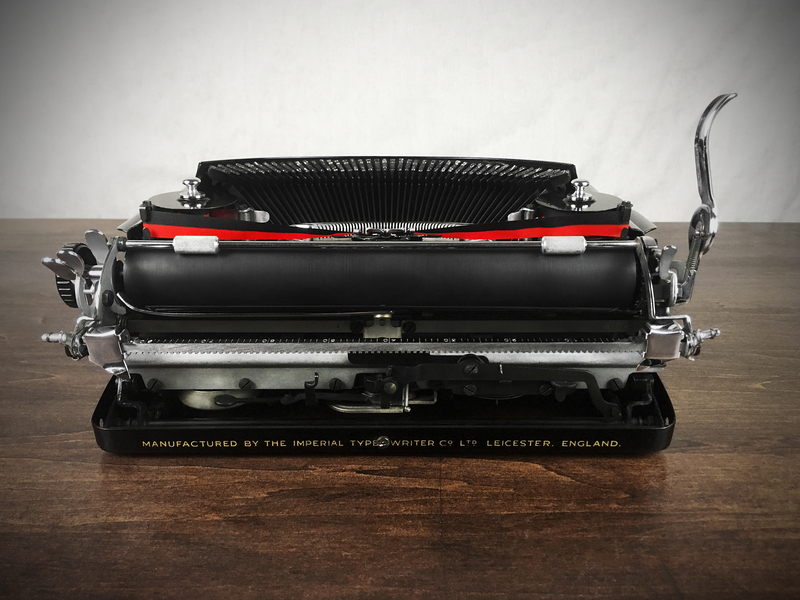 Offering a stunning refurbished 1930s Royal Model O portable typewriter with its original carrying case. The typewriter had been partially disassembled for refurbishment, adjustment, and cleaning. It has also been professionally polished and waxed. There some very minor imperfections to the ultra glossy paintwork. All the glass keys are clear, glossy and individually clean. The nickel plated metal parts have been cleaned and polished to match the “showroom” glossy deep black paint. Due to the exceptional glossiness of the enamel paint, a clear reflection of the antique table surface can be seen on the painted surfaces. The typewriter has pica for a typeface, which is the larger 10 characters per inch. A new high quality black & red ribbon was installed, and the platen shows minor signs of use. All the letter slugs were individually cleaned for crisp type quality. It types impeccably well, with crisp typeface. An extensive typing test was done to make sure everything moves and operates smoothly. The Royal ‘Standard’ Model O is one of the most reliable vintage typewriters from the era, and incredibly easy to use. The portable Royal comes with its original carrying case, and a copy of the manual. There are signs of use and age to the carrying case, with corner & surface wear. The case has been fully cleaned. It also received a coating of a polymer polish, which is semi-gloss, and dry to the touch. 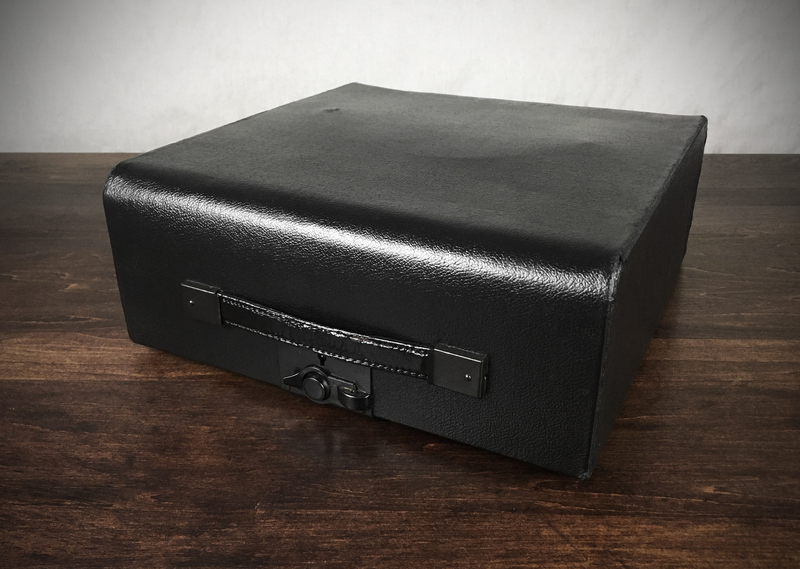 A handsome clean carrying case, and a fine companion to the typewriter. 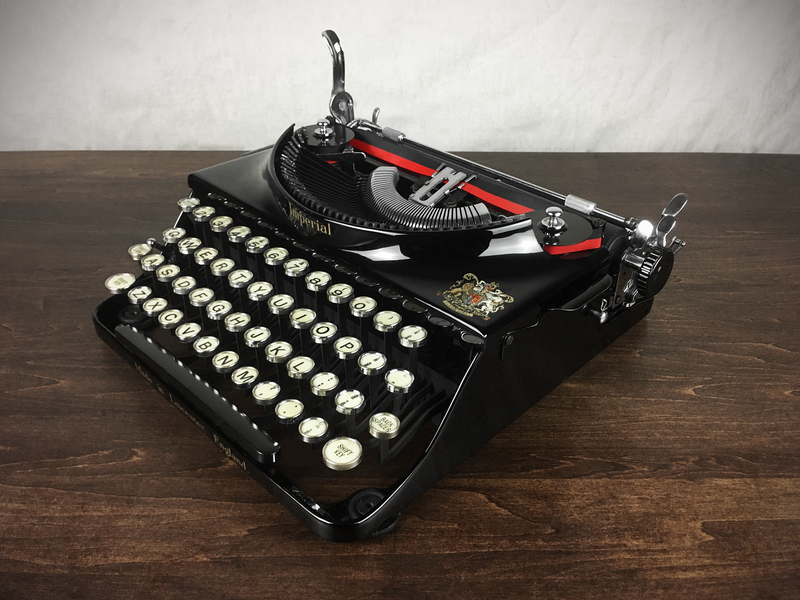 This is one of the nicest Royal Model O ‘Standard’ portable typewriters you will find. A lot of hours went into the refurbishment, and it shows. 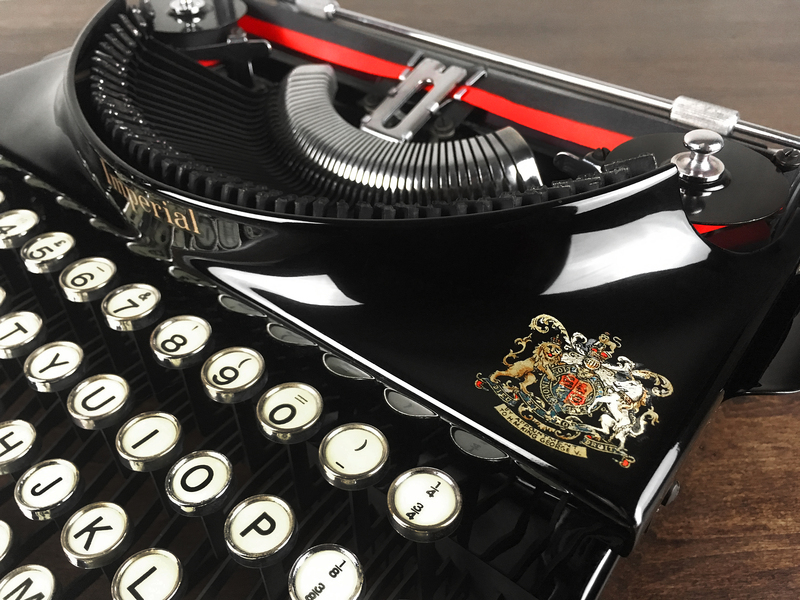 The Royal typewriter comes with a one (1) year warranty on the draw band (the cord which makes the typewriter carriage move). In the unlikely event the draw band should ever need to be replaced during this period, send it back to us for the service work free of charge. Shipping charges not included. All our typewriters are professionally packaged with a great deal of care. 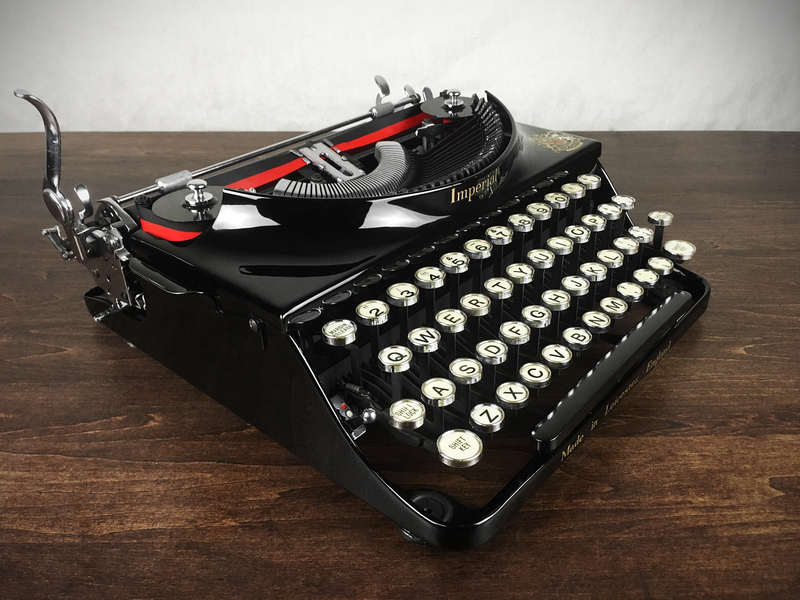 Within the lower 48 states, the typewriter will ship by UPS Ground insured. Additional shipping fees to Alaska & Hawaii via USPS. Note: International shipping by request. Please be in contact for exact international shipping rates to your country. Some countries will cost less to ship, and others more. Give us your international location, and we’ll get the exact shipping costs for you. The international shipping rate quoted is an estimate, and will differ by country. Offering a medium to large sized antique solid maple and pine 1920s drafting table. The cast iron knobs and hardware are fantastic. The base is made of solid maple and the tabletop surface is made of solid pine with a beautiful grain, patina and minor vintage wear to the surfaces. Everything is completely functional and exceptionally sturdy. The drafting table has a tilt function, and is also height adjustable. It has been carefully cleaned and waxed. There’s a manufacturers decal, which has been rubbed away, but looks like a Hamilton or Dietzgen logo. The wood grain and cast iron hardware are absolutely gorgeous, along with the patina from many years of use. This drafting table is perfectly suited as a kitchen island, small dining table or an office desk. Excellent versatility. The ability to adjust the height, makes the table perfect for use with chairs or stools. The industrial design lends itself well to plenty of uses in various decor environments. Whether it be a compact NYC loft, a home office, or a kitchen, this table will provide limitless options. NOTE: We offer “white glove” shipping throughout the US (48 states only). For Hawaii and Alaska, please ask for sea or air freight options. Buyer is responsible for the shipping costs, but we take care of the shipping arrangements. Etsy doesn’t provide a shipping calculator for large furniture pieces, so it is required that you contact us for shipping options and charges. The drafting table can be fully disassembled for UPS Ground shipping, and a handling fee will be added to the shipping charges for this method. We would prefer to ship the table completely assembled, and the carrier we use for the “white glove” service is fully insured. Tracking is provided for all the shipping arrangements we offer. Please be in contact for a shipping quote and delivery timeframe. NOTE: International shipping is only available via sea or air freight. Please be in contact for crate and carrier charges. Offering a set of 4 antique folding chairs. Early 20th century (c.1910s-1920s). The set is completely functional, with strong slat bottoms. Very well designed and in fantastic shape with an original rustic finish present. They’re very comfortable and solidly constructed. There’s an old but strong repair to one chair back with a few small nails, but the chair is just as sturdy as the other three. It’s not very often one finds a full set of 4 folding chair from this era in fully functional condition. Nice rustic original patina. They fold up compactly together for storage. They could be used indoors, or outdoors. Click here for more details. 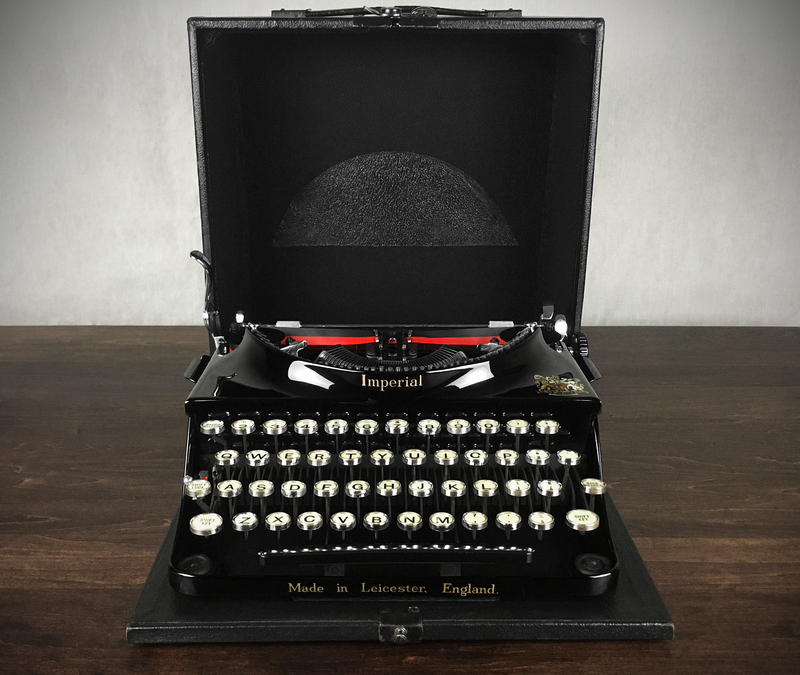 Offering a rare 1934 Art Deco Styled Imperial Good Companion Portable Typewriter. It’s in fully refurbished condition, with black high gloss original paint. The typewriter is an early example of ‘The Good Companion’ Model 1. There are some subtle differences from later production models, including a sleek carrying case design with chrome details at the rear. 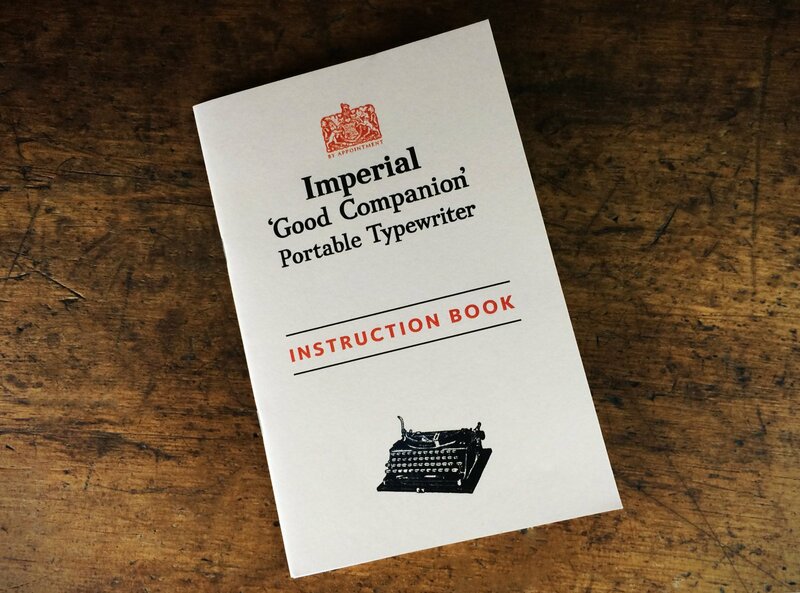 The Imperial portables from this era were all hand assembled to a high level of excellence. It shows minor signs of use and everything works perfectly. The Imperial received a meticulous cleaning, servicing, and a new ribbon. The chrome plating is flawless. The type bars and slugs have been cleaned, revealing the rare flat carbon black finish. All the original paint has been carefully cleaned, polished and waxed. A very high quality wax was used on the paint for a deep “showroom” shine. The rubber platen is in excellent condition. It’s an exceptionally beautiful machine from the 1930s. There’s a significant historical value to these early Imperial portables in this level of condition. The typewriter comes with the original case, which is in a “near mint” condition given its age, with a very nice wool felt interior. 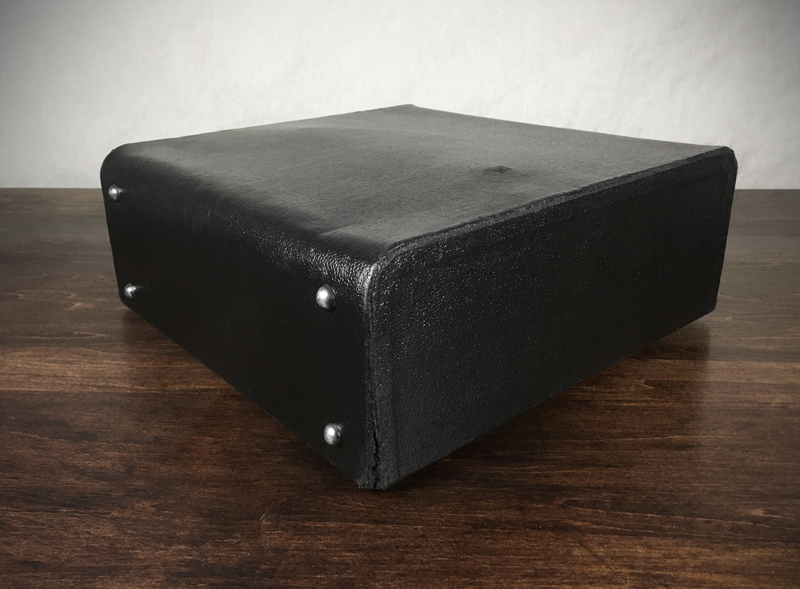 The leather handle is a new heavy duty replacement. There’s some minor pitting to the chrome parts on the case exterior from age. Fully functional. It comes with a high quality reprint of the original manual. There’s very minor wear to the corners of the case, and it’s a very worthy companion to the refurbished typewriter. Given the early manufacture date, it comes without the King George V Royal Warrant decal, which is found on later models. Click for further details.